We’d love your help. Let us know what’s wrong with this preview of Kabbalah by Joseph Dan. 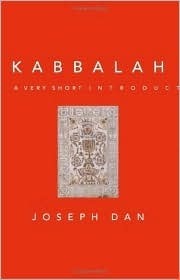 In Kabbalah: A Very Short Introduction, Joseph Dan, one of the world's leading authorities on Jewish mysticism, offers a concise and highly accurate look at the history and character of the various systems developed by the adherents of the Kabbalah. Dan sheds light on the many misconceptions about what Kabbalah is and isn't--including its connections to magic, astronomy, In Kabbalah: A Very Short Introduction, Joseph Dan, one of the world's leading authorities on Jewish mysticism, offers a concise and highly accurate look at the history and character of the various systems developed by the adherents of the Kabbalah. Dan sheds light on the many misconceptions about what Kabbalah is and isn't--including its connections to magic, astronomy, alchemy, and numerology--and he illuminates the relationship between Kaballah and Christianity on the one hand and New Age religion on the other. The book provides fascinating historical background, ranging from the mystical groups that flourished in ancient Judaism in the East, and the medieval schools of Kabbalah in Northern Spain and Southern France, to the widening growth of Kabbalah through the school of Isaac Luria of Safed in the sixteenth century, to the most potent and influential modern Jewish religious movement, Hasidism, and its use of kabbalistic language in its preaching. The book examines the key ancient texts of this tradition, including the Sefer Yezira or "Book of Creation," The Book of Bahir, and the Zohar. Dan explains Midrash, the classical Jewish exegesis of scriptures, which assumes an infinity of meanings for every biblical verse, and he concludes with a brief survey of scholarship in the field and a list of books for further reading. To ask other readers questions about Kabbalah, please sign up. I wanted an introduction to the kabbalah that was written by an authoritative non-crank. This book served that purpose. The author mostly confines his presentation to the Jewish kabbalah. Approximately seven percent of the text describes Christian and western esoteric kabbalah. Given my level of interest in the subject, the book being short is one of its most attractive features. Unfortunately, it is also dry. Over a period of several days, I fell asleep several times as I made my way through the I wanted an introduction to the kabbalah that was written by an authoritative non-crank. This book served that purpose. Given my level of interest in the subject, the book being short is one of its most attractive features. Unfortunately, it is also dry. Over a period of several days, I fell asleep several times as I made my way through the text. Given that the kabbalah is a root work of contemporary mysticism and one of my interests is how mysticism influences humanity, I'm not disappointed that I stuck with the book and finished it, but it was tough going. Surprisingly good and thorough evaluation of Kabbalah. Didn't know it could be summarized this well. This book may be short, but it is densely packed with information. In my quest for information related to a book I'm working on, I typed notes on most of this book. It is highly informative and I strongly recommend it to anyone interested in knowing how Kabbalah came about. Well written and clear summary of a vast field of history, religion, and philosophy. Excellent for beginners. Anyway, back to kabalah, as said I prefer it when used as a narrative element in a cool story, not as an alternative path to a god I don't believe exists. But for anyone with esoteric leanings, or a real interest in religion (either as a subject of objective study or as a path to a god they believe in), I'm sure this book can be enlightening. A small plus for some bonus Hebrew, but I'd prefer it had been more. My interests are more of that kind. Another plus for the artwork, which I wish had been in colour printing. Thank, erm, THE NAME for google. The role of the historian of ideas is not to uncover what something "really" is, but to present the development of a concept's meanings in different historical and cultural contexts, seeking to determine as far as possible the many usages and definitions that it has acquired throughout its history. It is not the task of the historian to state that Gershom Scholem was right and Simo Parpola is wrong or vice versa. It is not his task to declare that Johannes Reuchlin was "really" a kabbalist and Carl Jung was not. It is a historical fact that in the last half millenium hundreds of thinkers used the term in different ways, departing from the cultural context in which the kabbalah emerged. The story of this process has to be told in historical terms, avoiding the designation of one meaning as more "true" than the others. A great introduction to Kabbalah. For one thing, it is, indeed, very short, which is good if you're looking for information but don't have a lot of extra time on your hands to mull over a mire of minutae. There was a good amount of general information without overmuch detail, just the right amount for an introduction - ideal for those who don't know what kabbalah is really all about and are just starting out learning about it. It is a clear and concise account of the history and practices of the A great introduction to Kabbalah. For one thing, it is, indeed, very short, which is good if you're looking for information but don't have a lot of extra time on your hands to mull over a mire of minutae. There was a good amount of general information without overmuch detail, just the right amount for an introduction - ideal for those who don't know what kabbalah is really all about and are just starting out learning about it. Very interesting book, but poorly written. It is a great introduction into Kabbalah. It's amazing that Kabbalahists believe that they can affect the future in the present. There are many ideas and beliefs mentioned in this book that I'd like to learn more about. Overall, worth a read for a brief intro. Instead of "A Very Short Introduction", the subtitle of this book should be "A Very Boring History of People and Books Related to the Word Kabbalah". Ugh. I'm sure it's all very accurate, but it sure as hell isn't interesting. Informative, but rather academic for an introduction. Could have used a glossary for all the Hebrew words! Joseph Dan doesn't mince words and the taut spare academic style will not be to everyone's tastes. Its a positive virtue in his area of expertise (and he is clearly an expert) because the subject is infected with so much claptrap and nonsense that a surgeon's calculating knife is exactly what is needed to get clarity. In particular the chapters linking the development of Lurianic Kabbalah with the development of both modern messianic (Sabbatean) mysticism and modern Hasidic orthodoxy is very help Joseph Dan doesn't mince words and the taut spare academic style will not be to everyone's tastes. Its a positive virtue in his area of expertise (and he is clearly an expert) because the subject is infected with so much claptrap and nonsense that a surgeon's calculating knife is exactly what is needed to get clarity. In particular the chapters linking the development of Lurianic Kabbalah with the development of both modern messianic (Sabbatean) mysticism and modern Hasidic orthodoxy is very helpful. He draws a very clear line connecting all three which demystifies a great deal about the social and political realities of the modern Jewish world. Also given his expertise in Christian kabbalah that chapter feels too brief - in particular were there any connections between the Safed and Florentine movements? How did Christian scholars learn kabbalah and is there any evidence of cross-fertilization? Excellent overview, but very dry and dense, which is not surprising considering the complexity of the subject. Can get quite academic at time and if you're not familiar with the topic you'll need to cross reference numerous times. Interesting overview of a broad and varied topic. Would recommend. Gereksiz detay agirmeden Kabala ve Yahudi mistisizminin diğer unsurlarını açıklayan güzel bir eser. Konu hakkında hiçbir fikri olmayan birinin kolayca kavrayabileceği düzeyde ve aynı zamanda önemli neredeyse tüm unsurların tarihsel gelişimiyle işlenmesi de söz konusu. So let me explain why I picked up this book. I have a love for novels about Jewish characters. Historical, like The Red Tent or contemporary like The Ladies Auxiliary or a bit of both like People of the Book. It seems that whenever I hear about Jewish practices in the news, though, they focus on practitioners of Kabbalah. I figured this would be a good book to fill in some knowledge gaps that make novels so fascinating and also bring me up to speed on the modern Jewish practices. Unfortunately, So let me explain why I picked up this book. I have a love for novels about Jewish characters. Historical, like The Red Tent or contemporary like The Ladies Auxiliary or a bit of both like People of the Book. It seems that whenever I hear about Jewish practices in the news, though, they focus on practitioners of Kabbalah. I figured this would be a good book to fill in some knowledge gaps that make novels so fascinating and also bring me up to speed on the modern Jewish practices. Unfortunately, this was not the book I should have found for that purpose. This book was incredibly academic and dry. Along with that, it used many Hebrew words and I quickly lost track of all their meanings. Many pages, I read but did not understand. My favorite line came from page 32: "Yet, the message of the Zohar is delivered in the classical, midrashic homiletical fashion, exegesis of verses in the Torah and other parts of scriptures in the elaborate hermeneutical methodology perfected by the ancient sermonists of the midrash." What in the wide world does that mean????? For being a "very short introduction", someone should have put a notice in this book that you need to have read the very short introduction to Judaism as well as the very short introduction to long, rambling academic writing. For all the detractions, I did learn a couple of things. Kabbalah is not at all modern. Some of the early beliefs are integral to modern Jewish life. I also assumed it was a more liberal offshoot of Judaism, but it turns out that many kabbalists are some of the most orthodox practitioners. And while I had hoped to develop an understanding of the "new" popularity of Kabbalah, according to this book, it is too soon to tell what that will really shape up to look like. I'll get the one negative point out of the way first: This book is trying to cover over a thousand years worth of Jewish and Christian religious thought... in a hundred pages. This is why, despite it being a very short book, it has actually taken a while to read: Some pages are so jam-packed with names, alien concepts and new terminology that you have to put it down every now and again to let some of it sink in. It could all do with a bit of space to breathe. But hey, it is a "Very Short Introduc I'll get the one negative point out of the way first: This book is trying to cover over a thousand years worth of Jewish and Christian religious thought... in a hundred pages. This is why, despite it being a very short book, it has actually taken a while to read: Some pages are so jam-packed with names, alien concepts and new terminology that you have to put it down every now and again to let some of it sink in. It could all do with a bit of space to breathe. But hey, it is a "Very Short Introduction" so let's give it a pass on that one. Joseph Dan has attempted to outline the major developments in Kabbalistic thought from ancient Jewish mysticism right up to it's place in modern culture. For the most part he is clear and, for this layperson, seems to have picked out the key changes over time. I am completely new to this subject area so I cannot critique his accuracy but he seemed to take an unbiased, purely academic approach - not promoting one view of the kabbalah as better or truer than any other - something that this atheist appreciated. If you have any interest at all in how religions change and adapt over time, how stuff which has clearly just been made up can be presented as divine truth, and if you want to hear some absolutely nuts but also very cool concepts about the nature of the universe and the battle between good & evil, you should read this. Definitely one of my favorite books on the subject. The research work is mesmerizing, pretty much al there's to know (on a general basis) is described from a very formal point of view. The citations are always on point and the explanations left me satisfied at every moment. The sincere and direct speech of the author very valuable, as is his objectivity. His tone is solid and confident enough to be perceived wise and studied but not as super authoritative or rigid as some authors on the field may sound sometimes. An easy, enjoyable and eye opening lecture for anyone interested in the topic. Learned nothing. Waste of time. Very good, very short, very introductory. What more can you ask for? A historical presentation of Kabbalah.